Description: Brownish-black above with bold streaking; yellow crown; black eye line and whisker stripe; chestnut streaking on sides; and two pale yellow wing bars. Female is slightly duller than male, and has less chestnut on sides. 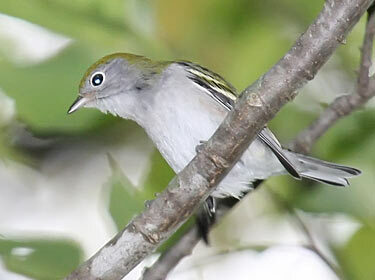 Fall adults and immatures are lime green above; have little or no streaking on back or sides; whitish underparts. Behavior: Has a habit of frequently cocking its tail. 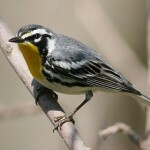 Habitat: Migrants found in thickets along woodland edges. 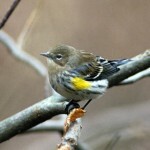 Often nest in low shrubbery, briar thickets, forest clearings or edges, and overgrown pastures. 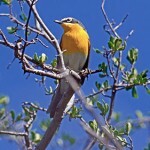 Where in Nebraska: Uncommon spring and fall migrant in eastern Nebraska, becoming rarer westwardly. Has bred at least twice in the state.